Two shades of tan make this pair special. Just like classic western work boots, these are kilted. Wonderfully handmade. Notice the great texture that comes from the back ridges of the alligator hides we use. They are still handmade. 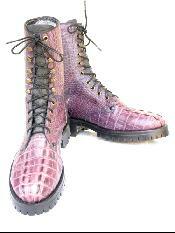 Great texture and a fun light purple color. Heavy industrial level lug sole. Made completely by hand. 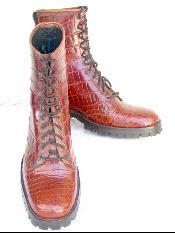 Wonderfully ridged hornback alligator. Here in rich chocolate brown. 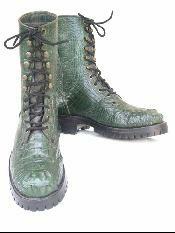 Great lug sole which is oil resistant. Richly colored alligator. 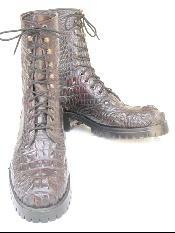 Farm raised alligator used and matched here to great effect. Still handmade. 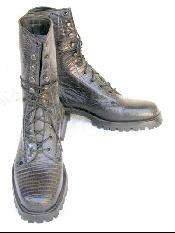 Dark navy blue lizard lug soled handmade combat boots. 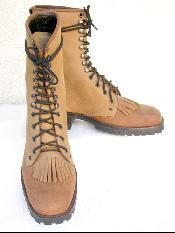 We still make our combat boots in our factory in El Paso Texas. 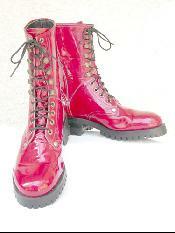 Dance the night away in these ruby red boots. Dorothy we're not in Kansas any more. Completey handmade by Tres Outlaws in El Paso Texas.